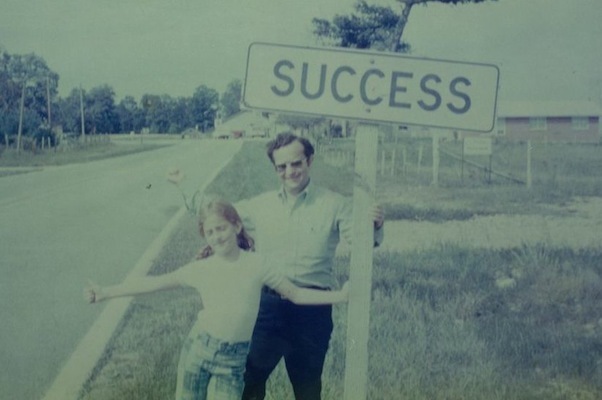 My dad, Bob, was the hardest working person I’ve ever known. The son of immigrants, his dad died when my dad was very young. When his much older brother and sister left home, he grew up in the rooms behind a grocery store. His mom made his clothes, and he learned that the way to improve your situation was to work. When I was born, my dad was a school teacher in Chicago’s inner city. He saw that work as a way to improve the situation of the bright, hopeful kids in that school. Then his father-in-law, my grandfather Nathan, suggested he could assist in other ways too. When we moved to St. Louis he became a stock broker, working with so many of you — charting trends, identifying companies that were about to soar, seeing his work as the way to help people fulfill their dreams. He never abounded his interest in working on helping–working on making a huge difference. When I was about my son Clarke’s age my dad told me why and how he did what he did, and that he knew someday I’d help change the world so all people could have hope. Somewhere along the journey he began taking apart and assembling personal computers. As he worked on them, he told me and my brother Todd that technology would become a window into worlds (and work) we couldn’t even imagine back then. He also used his tinkering at the kitchen table to show that we should never be confined by the packaging of other people’s limited expectations. The day I met my amazing husband Karl, he was taking apart a computer. Perhaps it was then I knew he was the one. My incredibly strong mom, Ann, recently described my dad as living “outside the box.” Yet as we talked about it more, we realized he really didn’t see there was a box. Anything was possible. The week before last, I had the joyous opportunity to spend every day with my dad at his nursing home. Even though he was no longer able to say more than a few words at a time, he put on a big smile for everyone who entered his room. Each nurse and aide made a special point of telling me he went out of his way to show how much he appreciated them. Being kind and thankful had become his work–and he was working as hard as ever. Many of us have heard the expression, “No one on their deathbed wishes they’d spent more time at work.” I think my dad may have been the exception. He was working until the very end, and that’s just the way he liked it. In the nursing home, at the office, in our kitchen, in his garden growing giant squash, or on Creve Coeur lake in his sailboat… Even the sky wasn’t a limit. He used to tell me to reach for the stars because at the very least you’d reach the moon. Here’s to my dad, with love. He’s right now, I have no doubt, working hard, amid the stars.